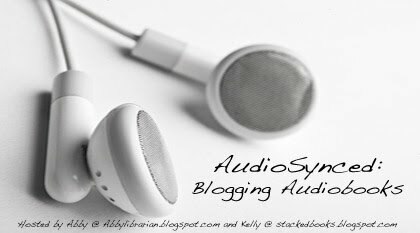 That's right, it's time for the roundup of May posts about all things audio - your AudioSynced Roundup! Annnnd this is a very special time for audiobook lovers because June is National Audiobook Month! Hey man, David Sedaris supports National Audiobook Month. You should, too! Get thee to a library and check out an audiobook this month! And if that's not enough to convince you, tune in to some of your favorite authors speaking about why they love audiobooks. And as part of your National Audiobook Month celebration, check out Audiobook Community where you'll find discussions, audiobook news, special events, and more. KidLitters may be particularly interested in SYNC, a YA audiobook haven featuring free downloads this summer (starting July 1). Audiobook Community is brought to you by the people at Audiofile Magazine. Kelly of Stacked has a post up about the Audies Awards. For more audiobook news, don't miss Audiobooker, a Booklist Blog written by Mary Burkey, a teacher, librarian, and audiobook addict. Kimberly of Stacked reviews Bog Child by Siobhan Dowd and Kelly chimes in with What Can Ruin an Audiobook. Carin at Caroline Bookbinder shares a review of Grayson written and narrated by Lynne Cox. She says "Very short, the story of just a couple of hours' time, the audio is the same length so it's like it was occurring in real time. The audio is read by the author, who has a languid and calm tone, even when relating worry and confusion. I think if the book had been longer, her tone might have had a somnolent effect, but in this brief tale, it was perfect." Mel of Mel's Books and Info reviews Reality Check by Peter Abrahams, narrated by Jim Colby, of which she says "While Colby was clear and easy to understand I had difficulty getting into the story, which for me is unusual especially in audio format. I found myself eager to turn off the audio and switch to book format, mostly because I didn't think he was engaging enough as a reader." Mel also reviews Fallen by Lauren Kate, narrated by Justine Eyre, of which she says "Her narration is the picture of clarity and is spot on for Luce and her schoolmates." Over at Traveling Classics, you'll find posts about How to Be a Pirate by Cressida Cowell, Oliver Twist by Charles Dickens, Robinson Crusoe by Daniel Defoe, and Sherlock Holmes by Sir Arthur Conan Doyle. Amanda at A Patchwork of Books gives us her April/May audiobook roundup with reviews of The Lightning Thief by Rick Riordan (narrated by Jesse Bernstein), The Outcasts of 19 Schuyler Place by E.L. Konigsburg (narrated by Molly Ringwald), and Memoirs of a Geisha by Arthur Golden (narrated by Bernadette Dunne). Jeanne of Books for Ears shares a review of Under the Dome by Stephen King, narrated by Raul Esparza. Still Midnight by Denise Mina, narrated by Jane MacFarlane. Knucklehead written and narrated by Jon Scieszka. Woods Runner by Gary Paulsen, narrated by Danny Campbell. A Damsel in Distress by PG Wodehouse, narrated by Jonathan Cecil. In the Company of the Courtesan by Sarah Dunant, narrated by Stephen Hoye. The Turnaround by George Pelecanos, narrated by Dion Graham. The Whale Rider by Witi Ihimaera, narrated by Jay Laga'aia. What a fantastic roundup this month! Thanks to all who participated. Did I miss any links? Add them in the comments and I'll update the post accordingly. Didn't get to an audiobook this month? That's fine - catch us next month. Kelly will host another roundup at Stacked on July 1.